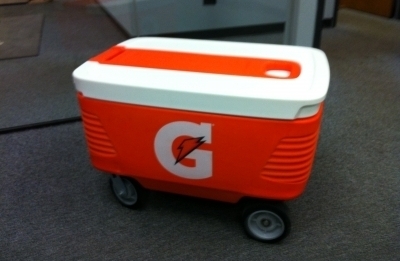 Littleton, Colo. – Elkhart Plastics, Inc. (Elkhart) is proud to announce that it was recently commissioned by Gatorade to manufacture a custom sideline cooler. The 50-quart coolers will be used on the sidelines of major sporting events including the NFL and select NCAA football games. Boasting an assembly that is aesthetically pleasing yet rugged, the cooler features sturdy wheels and a collapsible handle for easy maneuvering around sporting events. The coolers will regularly be seen on televised sporting events and must stand up to the elements while keeping the Gatorade stored within at a refreshing temperature. Comprised of a rotomolded basin, lid, and handle, the assembly itself is simple yet involved as it includes very advanced foaming fixtures for insulation. The rotomolded components provided sturdiness while enabling smaller volumes to be manufactured at a lower cost. Elkhart’s competitive prices, consultative approach and unique end-design help make it a leader in the industry. Working with Tether Design of Seattle, Wash., Gatorade’s design partner, Elkhart’s Littleton facility offered a unique cooler solution. The cooler is 20.5 inches wide by 30 inches long by 20 inches high and includes durable wheels for outdoor use. Coolers will not be available for retail sale. The coolers are manufactured at Elkhart’s Littleton, Colo., plant.